For all of Evil Geniuses’ faults, their respective player’s individual brilliance just seems to shine too bright as they successfully took out the only two remaining Chinese teams in the tournament, EHOME and PSG.LGD, back-to-back. Now, the boys in blue will look to continue their run against Clement “Puppey” Ivanov and Team Secret tomorrow, where the winners will face off against Virtus.Pro in the best-of-five Grand Finals. 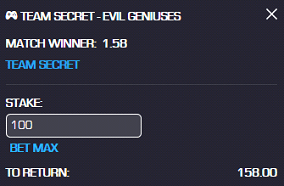 In terms of drafting, Evil Geniuses have not really played anything off meta. Save perhaps for them playing Death Prophet for Syed Sumail “SumaiL” Hassan against EHOME, they’ve stuck to their guns and it’s worked well for them so far. It also works that they have some of the most individually skilled players on the planet on their roster, as well as a captain in Tal “Fly” Aizik, who excels at reading the map and putting his team in the position to counter their enemy’s movement. Up against Team Secret, though, things won’t be as straight forward. So far, Evil Geniuses’ victories have come against teams who, though skilled, rely on a single hard carry to win them the game. The same can’t be said for Team Secret. The argument exists that they have a tendency to do that with Michal “Nisha” Jankowski, but anyone paying close attention to how Team Secret play know that it’s a collective effort and any one of their players could completely take over games or, at the very least, change its outcome. With Evil Geniuses showing a severe lack of versatility in terms of their drafts, they’ll have to rely on all of their players to come up big again. Although that’s always possible, it’s arguably not enough against a powerhouse team like Team Secret.